There is just something so cheerful and comforting about doughnuts. 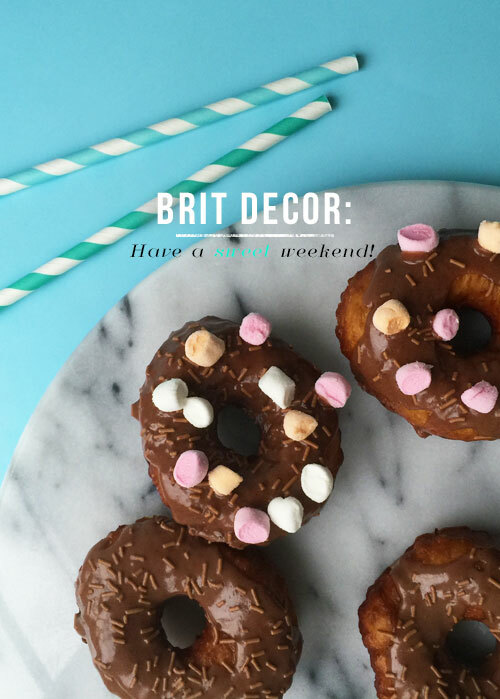 These sugary gems take me back to days spent at the British seaside - the sweet smell of freshly cooked doughnuts for sale in painted wooden huts on the seafront, or temptingly lined up alongside fluffy pink candy floss at the fairground. I love to reminisce! 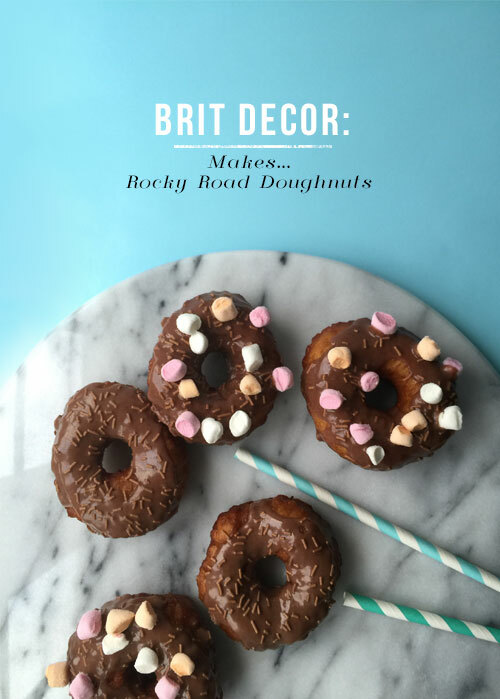 I was recently asked to reveal the contents of my coffee table for an article (more to come on this soon) and one of the things I included was my 'food of the moment'; a doughnut. 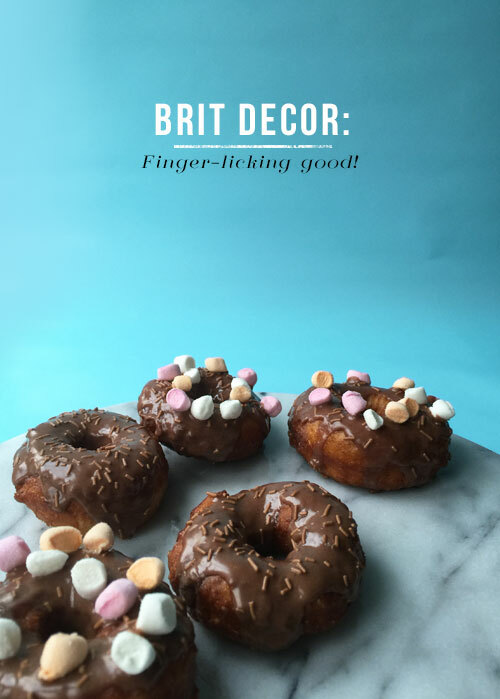 Although it's not one of the healthiest food items I could have chosen (that's an understatement), doughnuts have always been a favourite 'pick-me-up' treat of mine, and who can deny that the glazed and icing topped versions look particularly fun and vibrant. In technical terms, the doughnuts I am sharing with you today are not, strictly speaking, Rocky Roads, due to the lack of crunchy ingredients, however, the flavouring is very much there - thanks to my recent discovery of Whittard's Rocky Road hot chocolate powder (yes it's an easy option) and the all important marshmallows of course. Mix half a teaspoon of sugar with the yeast, along with a couple of teaspoons of warm milk. Leave to froth-up for around 15 minutes. Then sift the salt and flour into a mixing bowl with the remaining sugar. Into the middle of these ingredients pour the yeast mixture, adding the egg, softened butter and the remaining milk. Knead all of these together to form a soft and springy dough. Leave the dough in the mixing bowl and cover with a damp tea-towel for up to one hour (in a warm place) until the dough has doubled in size. Lightly spinkle flour over a work surface before rolling out the dough to a thickness of approximately 1cm. Use an 8cm cutter to cut out the doughnut circles and a 2cm cutter for the inner circle. Lay the dough circles onto a baking tray and cover with cling film. Leave for a further 20-30 mins until the dough has risen. Heat the sunflower oil in a pan - I used 1litre but could have used less. Once the oil is fiercely hot (be very careful!) gently place the doughnuts into the oil (2 or 3 at a time depending on the size of your pan) cooking each side until golden brown. Use a slotted spoon to remove the cooked doughnuts from the oil and place onto some kitchen towel to drain. Leave to cool. For the icing, mix the icing sugar with the water and then add the chocolate powder. Mix these ingredients together until you have a thick(ish) paste. Place this onto each doughnut and then top with finely chopped marshmallows and chocolate sprinkles.